Surprise! Guests are stopping by on their way through town and you have exactly seven minutes to pull something together. Not to panic. If you have four basic ingredients handy, you can make an outstanding appetizer tray and not do any cooking either. Those ingredients are fruit, meat, cheese, and some sort of bread or cracker. Everything else you add is a bonus, but not essential. The key is to invest your time in making the tray look appealing. Remember people consume with their eyes, so the goal is to make it look pretty! Here's my "go to" stash:I start with an optional item, usually some sort of dip or spread. I typically keep hummus in the fridge because it keeps forever and is a perfect compliment for adding some zest to the crackers or raw vegetables. Put the hummus in a small bowl and use it to anchor one corner of the tray.On the opposite corner add a sweet fruit. I love using grapes because they provide height to the tray. Alternatively, slice a nectarine or pear.Next, add a meat element to the tray. 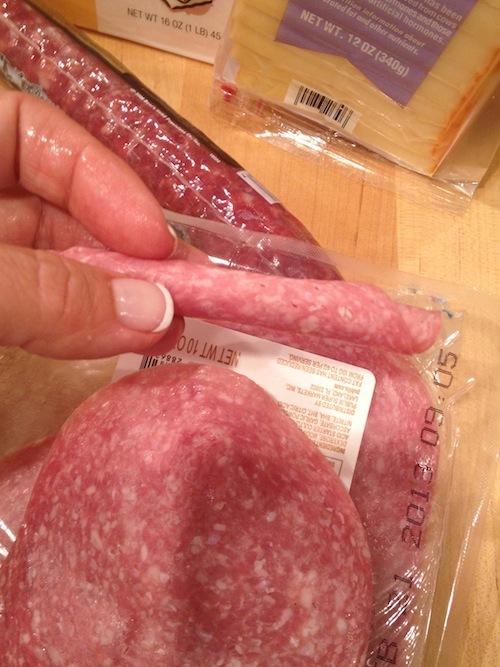 I like to roll up salami slices. This allows people to pick up their food without using a fork. After adding meat to the tray, put on some cheese. In this case, I used basic muenster slices, cut on the diagonal to look fancy!Double down! At this point add additional fruit, cheese, and meat as your pantry and refrigerator allow. I used Italian salami (also from the pantry since it keeps for eons! 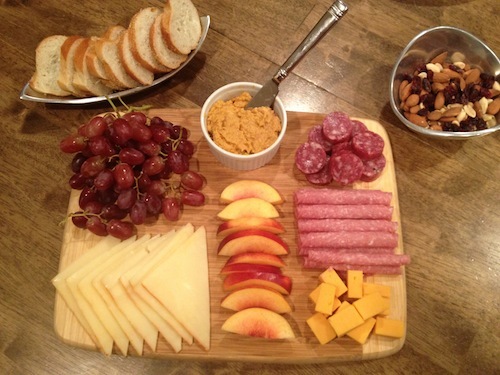 ), sharp cheddar cheese, and nectarines.Put your pretty tray out and serve with baguette slices or crackers and nuts. Presto! Ready for company. Whatever isn't eaten is ready to be folded into a picnic or kids' lunches.